Owner Operators – NEW PAY INCREASE – Earn up to $1.50 CPM! Earn More at Marten with Industry-Leading Pay! Don’t Wait! 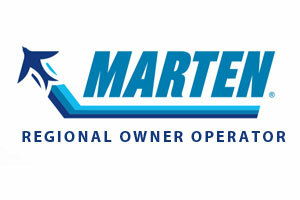 CDL A Truck Drivers – If you are an Owner Operator, Marten has a great dedicated opportunity for you. You can earn industry leading pay – $1.25 plus fuel surcharge on all practical miles. That adds up to an average of $1.50 CPM for every mile you drive! You’ll also receive our immediate detention pay, stop pay, and inclement weather pay, meaning an Owner Operator can earn high annual pay and get home weekly. Home time and pay may vary by hiring area and specific route details – ask a recruiter for details. Call us today at 888-835-3610, or fill out the 1-Minute Mini-App on this page, and we’ll contact you!